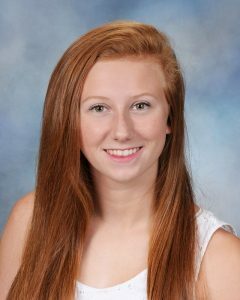 The Garden City Scholarship Fund is pleased to announce that Emily Burns has been selected as the 2018 recipient of the Fund’s Julia Maloney Scholarship. Emily is the twenty-first Garden City High School senior to receive this prestigious award. The scholarship was made possible by a generous bequest of the late Julia Maloney, an elementary school teacher in Garden City for 47 years. The announcement of the award, which comes with an education grant of $12,000 over four years, was made at the annual Senior Awards Ceremony at the High School on May 31st. Selection for the Julia Maloney Scholarship is based on academic excellence, character, service to school and community, a personal interview and an essay describing a teacher who has had a strong, positive influence on the student. The essay is read by the student at graduation and the celebrated teacher is present. In addition to maintaining an outstanding academic record, Emily is a Garden City High School Varisty Swimmer and is a three-year Finalist in County, All Conference and All Division. Additionally, she swims at the club level for Long Beach Aquatic/Long Island Express and Queens Aquatics. Emily makes sure to share her love for swimming and inspires others by serving as a mentor to younger swimmers through the Swimathon of the Child life Program at Winthrop University Hospital. After she gets out of the pool, Emily runs meetings and raises money for the International Thespian Society and serves as co-editor of the Literary Spanish magazine El Ateneo. Emily is a member of the Garden City High School National Honor Society, the Spanish National Honor Society and the International Thespian Society. For her essay, Emily wrote about her AP Psychology teacher, Mr. Highfill, who taught her to realize that her personal battle with anxiety was nothing to be ashamed of. She learned the causes and triggers for anxiety and many other mental illnesses. Inspired, Emily decided to write about her journey. She called it “My Secret Friend”, and described anxiety as a “friend” that she learned to fight with her own power. The piece was eventually published in ECHO, the school newspaper. Emily’s newfound confidence empowered her to start Garden City High School’s first Psychology Club with Mr. Highfill as an advisor. Julia Maloney is smling from heaven because the spirit of the award she created is alive and well in its recipients twenty-one years after its inception. Emily is no exception.